SPLICEDwire | "Good Night, And Good Luck." movie review (2005) "Good Night And Good Luck" review, George Clooney, David Strathairn, Robert Downey Jr.
After a bold, darkly absurd and surprisingly assured directorial debut with 2002's "Confessions of a Dangerous Mind," I was gung-ho to see George Clooney's new film, "Good Night, and Good Luck." A politically charged black-and-white drama about reluctantly crusading journalist Edward R. Murrow's career-defying and career-defining challenge to the communist witch-hunts of the 1950s, the film almost never leaves the visceral situation-room tension of CBS's news studios, as weeks of news reports beget vehement rhetorical replies that bear chilling similiarity to the propaganda of the powerful in preset-day Washington. 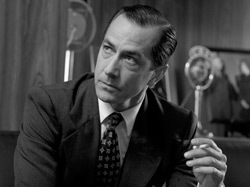 Star David Strathairn provides dry, decisive nobility to his spot-on portrayal of Murrow (Clooney, Robert Downey, Jr., Jeff Daniels and Patricia Clarkson play co-workers), but the most resounding screen presense is McCarthy himself. Clooney (who co-wrote the meticulously fact-based script with actor Grant Heslov) cast no actor to play the now-disgraced senator, but instead uses only real footage of his committee hearings and his rebuttal appearance on Murrow's "See It Now" (in its entirety). Unquestionably, "Good Night" is a commentary on the dangerous direction American politics seems headed, and the film accomplishes this masterfully. But while Clooney's superb command of cinematic language is impressive after only two films as a director, this movie's laconic, matter-of-fact style (a deliberate choice, probably designed to sidestep right-wing accusations of editorializing or embelishment) leaves no room for character development outside of a throwaway subplot about two CBS employees keeping their marriage to each other a secret.